He turned, slowly, like one of the animatronic creatures at Disneyland. She leaned back, just a little. She wet her lips. The valet was watching them now. His other hand came up and slapped her. Hard. Hard enough to knock her glasses off. She stepped back, hands crossed on her upper body, palms pressed against herself, fingertips near her shoulders. “Is something wrong?” The valet hadn’t stepped closer, but he had one hand on a telephone at his little kiosk. Barry turned, not slowly, not animatronic. Spun around and took a step toward the valet. The valet lifted the phone. Barry took one more step and hit him in the side of the head. He fell against the wooden valet stand and he and the stand fell into the gutter. Turning without a glance down at the valet, Barry took two steps back to her and grabbed her arm, pulling her toward the parked cars. He stopped. Didn’t turn, just stopped. Her scream made Barry flinch and let go. Three men bounded from the restaurant’s front door. Without even a glance at her, Barry plowed through the line of cars sliding by, horns blasting, little chirps from the tires as brake pedals were shoved down. Her tears washed him away as he melted into the darkness at the back of the parking lot. She didn’t see him again for 14 years. 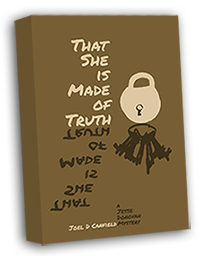 Find out who and why in That She Is Made of Truth. I haven’t read this one yet because I have a million books to read and not enough time… But I can’t wait to read it! Love to hear what you think of it when you read it, how it compares to my other books.